The standard sizes of eyepiece graticled used to be 16, 19, and 21 mm. For your convenience, this has been greatly expanded to accommodate a variety of equipment without the need to special order. The following table will assist you in determining appropriate eyepieces for common brands. This list is not comprehensive so please enquire if your eyepiece or brand is not listed. For measurement of large objects in conjunction with a graduated mechanical stage, and for alignment as well. Used as NE50 but for measurements in two directions and for sighting and alignment. Image covers the entire field of view. Used as above. Broken lines enable fine detail to beseen at the breaks. A thin boundary would be lost behind a a continuous line. Use as crossed lines, but for the measuring of distances between thelines. Greater accuracy can be obtained by locatng the specimen detail between the graticules gauge pair. These scales are used for the measuring of lengths of specimen or distances between points on a variety of different shaped objects. NE1scale showed: This eyepiece graticule has an overall length of 10.00mm with 100 subdivisions of 0.1mm. 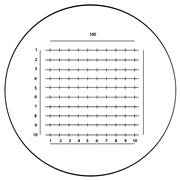 When used with a x10 objective each division will represent 10 microns on the specimen. By dividing the division of the chosen graticule by the magnification of the objective one obtains an approximate value that each division will represent on the stage. Used as a horizontal and a vertical scale, they are especially useful when interested in measurement in different axis. Note: These scales may need to be calibrated, according to intended use. There are a number of uses for the grids and squares listed and they will largely depend on the individual user's application. Sectoring: A squared graticule might be used for the systematic examination of a specimen. Some of the squared patterns are numbered to aid in the identification of areas of interest. Sectioning is particularly useful for making drawings of specimens onto graph paper. The chess-board type of pattern helps the user to distinguish the position being examined: the darker squares are translucent, while the lighter ones are transparent, avoiding eyestrain in prolonged counting as many be necessary in hematology. These patterns provide the same advantages when used with image analysis and capture devices. Counting: A squared graticule can be used for counting. Here the basic principle is that a small area of the specimen is analyzed in order to obtain information about the total area. This minimizes wasteful work enabling simple analysis of a paricular area. An example of this would be the comparison of large to small particles in a specimen. By using the Miller craticule (NE57) only the smaller particules in the small square are counted, the result being multiplied by ten for comparison with the number of larger particles in the large square. Squared Grids: Squared grids can be used in particle size analysis as simple technical aids where sophisticated image analysis systems are not required. The areas of the particles to be measured can be estimated by simply counting the number of squares occupied by those particles. It is necessary to estimate fractions of a square or make a rule (e.g. count as a square all partly covered squares at the right and bottom sides of the grid, and ignore partly covered squares at the left and upper sides of the squares). This method would only be useful for a fairly crude estimation of a large diameter. Simple grids are convenient for making sketches of the obseved speimen on graph paper. They are also useful for particle counting. Useful for particle counting, particularly when reference is needed between workers. Also, they are useful for area of specimen determinations. Useful for area of specimen determinations, especially rectangular shapes, also for particle counting. The dark squares are translucent. Used as an alternative to simple grids for area of specimen determination and paricle counting. Alternative light and dark squares help to reduce eyestrain. Combines three areas in one for convenience, giving area ratios A:B of 1:3 and B:C of 1:2. The ratio of large to small squares is 9:1. Originally designed for hematology, they can be utilized for rapid counting of any evenly spread field of particle. 1. American J. of Clin. Pathol. Vol.20, 1950, page 1079. "Time Saving Device For Counting Reticulocyte." G.Brescher and Schneiderman. 2. Practicle Haemotology – J.D. Dacy. Published by J.A. Churchill. 2nd Edition 1956 page 25. Originally designed for water particle analysis, but may be used for other aspects of particle counting. Grid showed: Ratio of full square to smallest is 50:1. Area is 2500:1. Reference: Microscopy of Drinking Water. Can be used for two-way measurement when calibrated as a micrometer. This design leaves the circle clear of obstruction. In addition the intermediate lines are broken to improve ease of reading. Gauge pairs occupying a field of view of 10mm. Each gauge is proportional to its adjacent number. The approximately size of the smallest pair = 0.1mm. The use of the eyepiece graticules showed in this section make it possible to analyze specimens containing particles as an alternative, or in addition to, sieving. Graticules for particle size analysis are particularly popular when there are only limited quantities of particles or where particles are smaller than 50 microns in diameter. Typical substances analyzed are sand grains, soil particles, plant seeds, fertilizers, abrasives, liquid droplets, pigments, pulverized coal, silica, fibers and fine dust. The basic principle employed is to compare particles to the globes and circles of varying sizes that appear on the graticule – dark particles being compared to solids globes, and light or transparent ones to the circles. Naturally the procedure varies with the graticule concerned, more information about which is given below. Please note that for calibration the circles and globes will represent particles smaller in diameter by the magnification of the objective. 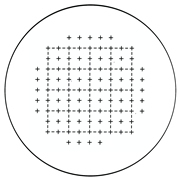 The graticule consists of a central rectangle, sub-divided into nine smaller rectangles with a number of increasing circles outside the top and bottom horizontal edges. The marked figures are the diameters of the circles in units. 250 units represent the horizontal length of the large rectangle. Rectangle size is 4.5mm x 2.025mm. Circle sizes in microns are 450, 360, 270, 225,180,145, 110, 74, 37, and 18. The circle areas of the Porton greaticules increases with Root 2 progression as do the divisions on the right hand side of the rectangle. These divisions are numbered for convenience. The rectangle size is 4.5mm x .25mm. 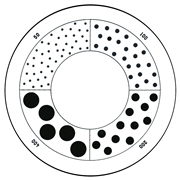 Circle sizes in microns are 560, 400, 280, 200, 140, 100, 70, 50, and 35. The specimen is racked on the mechanical stage of the microscope and traverses are taken right across thee deposit sizing all the particles encountered. The NG12 is particularly useful since the array of globes and circles are conveniently close to where the particles pass. At the end of each band of the sample the mechanical stage is traversed vertically to take in the next band until the whole sample has been covered. In this graticule the circle areas double progressively, hence the diameters alter by Root 2, so that the size classes can form a continuation of the standard series of sieves for particle sizing. Each particle is assigned to a size class defined by two adjacent circles, which represent the size limits of that class. Thus the distribution of size is obtained in terms of the diameter of circles having the same projected area as the particles. This method will cover particles in the range 150 micron to 0.38 micron. The size distributions with respect to their number and weight are determined separately. Final results are calculated as cumulative percents. Originally designed by the National Coal Board for use in coal mining. Designed to extend the sizing range of globe and circle graticules. Example: Used in conjunction with NG2 the overall size range = 128:1. The circles increase by 2. Note: Both graticules would have to be used with the same microscope, eyepiece and objective. Calibration factors are required for each of these graticules. See note below. The Walton and Beckett graticule is used for counting fibrous dust (e.g. asbestos or glass fibers) and is particularly useful where the majority of fibers to be counted are shorter than 5 microns. The circle is divided into four by two diametrical lines scaled in units of 5 and 3 microns respectively. 3 and 5 microns are the critical measurements of fiber lengths and diameters used in fiber counting. Unlike the usual globes of other particle graticules, the Walton and Beckett have a series of shapes to compare objects with. These shapes have been designed for comparison with fibers, especially since they incorporate an aspect ratio of 3:1 or 5:1 essential for such analysis. IMPORTANT NOTE: The circle on these Walton & Beckett graticules must represent 100 microns at the stage and each one must be manufactured to suit the individual instrument. For size and distribution assessments of aersol droplets. Used in conjunction with a 40X Microscope for direct measurements of droplets from 50-400 micron diameters. The actual pattern sizes are 50, 100, 200, and 400 microns. W.H.O. (Details on Request) and G.A. Matthews. Imperial College. For counting particles in any of three areas of known size. The graticule is calibrated in the same manner as a normal eyepiece scale. The result is then used to calculate the area of any square. This is used to quickly determine the relationship of components to each other using random sampling. Curtis gives an example of its application, where a researcher may want to see whether or not a certain drug affects the volume proportion of cell types in a given organ. With this graticule the proportion of points lying over the image of one type of component is statistically proportional to the area occupied by that component. The 25 points of the array are placed over the field of view at random, so that a comparison can be made between the number of points touching the one type of component, with number touching the other type of component in each viewing. A series of observations will yield an increasingly accurate ratio of the comparative incidence of each type of particle. Reference: A.S.C. Curtis. Medical and Biological Illustration, Vol. 10. pp 261-266. "Area and Volume Measurements by Random Sampling Methods." This graticule was designed for the pharmaceutical industry. However, it is also useful where particle size considerations are restricted to 10mm and 25mm. Dots and circles give quick references for these two sizes. In addition a scale is incorporated. The microscope must be calibrated when ordering this graticule, such that the circle must equate to 1mm on the microscope stage. Reference: The United State Pharmaceutical Conventions Inc. Pharmaceutical Forum Vol. 19 No 6. Simple counting for geological and soil analysis. Reference: L.G. Briarty. "Stereology: Methods for Quantitative Light and Electron Microscopy." Sci. Prog. Oxf. 1975 62; 1-32. Similar to G49 but extended to 100 points, which are indexed. In this simplest form, sterology is the science where information about a three dimensional object is obtained from only a two-dimensional section of that structure. An adequare representation of sections of a specimen is obtained. The graticule is superimposed upon the specimen (or micrograph/projected image of the section). An overall introduction is given by: L.B. Brianrty. "Stereology: Methods for Quantitative Light and Electron Microscopy." Used to estimate the three-dimensional surface areas or the surface density of a component in a given volume, when the component does not have a random orientation. It comprises a test system with parallel curved lines used for measuring the intersection of points. Reference: W.A. Mertz. "Mikroskopic" Vol. 22 1967 pp 132-142. Consists of 15 lines of equal length connecting the verticals of a regular hexagonal point network. Reference: E.R.Weibel Lab. Invest. Vol. 22 pp 131-152. "Principal and Methods for the Morphometric Study of the Lung and other Organs." Used when making a surface to volume ratio of a structure per mass unit. This graticule consists of a number of short lines with interruptions as long as the lines. Basically, the number of intersections falling over the short lines is counted and the number of endpoints falling on the end of the structure is determined. Reference: E.R. Weibel, Journal of Microscopy Vol. 95. pp 373-378. Current Capabilities and Limitations of Available Sterrological Technique, point counting method. Reference: E.R. Weibel, G.S. Kishtler & W.F. Scherle. 1986. J. Cell Biology.30, 23. Standard pattern discs for metallurgical stereometric analysis of grain size in polished metal sections.